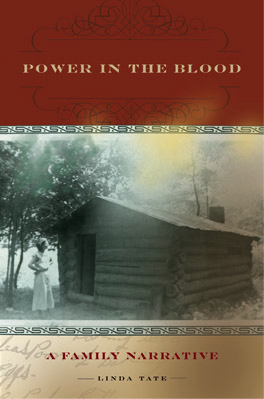 Power in the Blood: A Family Narrative traces Linda Tate’s journey to rediscover the Cherokee-Appalachian branch of her family and provides an unflinching examination of the poverty, discrimination, and family violence that marked their lives. In her search for the truth of her own past, Linda scoured archives, libraries, and courthouses throughout Kentucky, Tennessee, Alabama, Illinois, and Missouri, visited numerous cemeteries, and combed through census records, marriage records, court cases, local histories, old maps, and photographs. As she began to locate distant relatives – fifth, sixth, seventh cousins, all descended from her great-great-grandmother Louisiana – they gathered in kitchens and living rooms, held family reunions, and swapped stories. A past that had long been buried slowly came to light as family members shared the pieces of the family’s tale that had been passed along to them. Power in the Blood is a dramatic family history that reads like a novel, as Linda’s compelling narrative reveals one mystery after another. Innovative and groundbreaking in its approach to research and storytelling, Power in the Blood shows that exploring a family story can enhance understanding of history, life, and culture and that honest examination of the past can lead to healing and liberation in the present. Read the first chapter of Power in the Blood – and check out interviews with Linda, reviews of the book, and more at the publisher’s website. Listen as Linda reads the opening of Power in the Blood.